The most effective solution for indoor location tracking would be iBeacon. This technology easily edges out WiFi and NFC with its combination of flexibility, accuracy and a low-cost infrastructure. In terms of range, beacons function in the interim of NFC (too narrow) and GPS (too broad) ranges, and that is what makes it more effective than the other two. They are even ideal for detecting smartphones indoors, where GPS isn’t always effective, and can communicate with apps on devices when they are indoors. “Battery-life is one of the biggest challenges for the Beacon industry growth due to the high servicing costs. Each time a beacon requires a replacement battery there is an associated service cost, and that adds to the total cost of ownership,” said Barry Jenkins from UK-based GCell, a new maker of Bluetooth beacons for proximity marketing, as reported by GPS Business News. The company just announced their entry into the iBeacon hardware market with the G100 Indoor Solar Beacon. The World's first energy harvesting iBeacon offers a renewable energy supply and a 100-millisecond advertising rate as default. 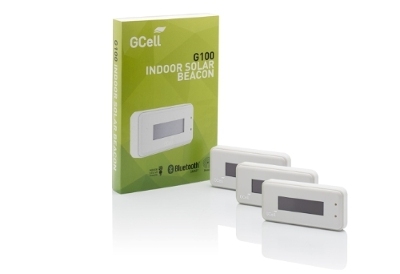 The G100 Indoor Solar Beacon is an enterprise grade iBeacon aimed at large-scale deployments. It has the longest lifespan. Price of the GCell G100 starts at £33 GBP at low volumes and the company offers discounts for large volumes. The number of beacons deployed worldwide has exceeded six million, according to proximity marketing directory http://www.Proxbook.com. The use of beacons throughout airports, cinemas, hotels, retail stores and sports stadia allow the broadcasting of Bluetooth signals that a smartphone can receive and understand. This makes it possible for brands and venues to communicate with audiences at a precise location at the time of their visit. Utilising their expertise in energy harvesting GCell plans to overcome one of the major challenges constraining the mass adoption of iBeacon since Apple introduced the technology in June 2013. Professor Michael Grätzel, recipient of the 2012 Albert Einstein World Award of Science and the 2010 Millennium Technology Prize for inventing Dye Sensitised Cells, commented "I am delighted that GCell have introduced the World's first indoor solar powered iBeacon. GCell continue to lead the way for the use of indoor photovoltaics. I anticipate that this is the first of a series of indoor wireless beaconing and smart sensor devices powered by a renewable energy source." Barry Jenkins from GCell remarked "We have been patiently watching the iBeacon ecosystem to mature. We quickly recognised that battery-life is one of the biggest challenges for iBeacon industry growth. Initially Beacon hardware vendors used small coin cell batteries typically lasting less than a year. Each time a beacon requires a replacement battery there is an associated service cost that adds to the total cost of ownership."